Producing perfectly straight cuts with a circular saw can be a little tricky, even for some professional carpenters. But, the new WORX 6½-in. 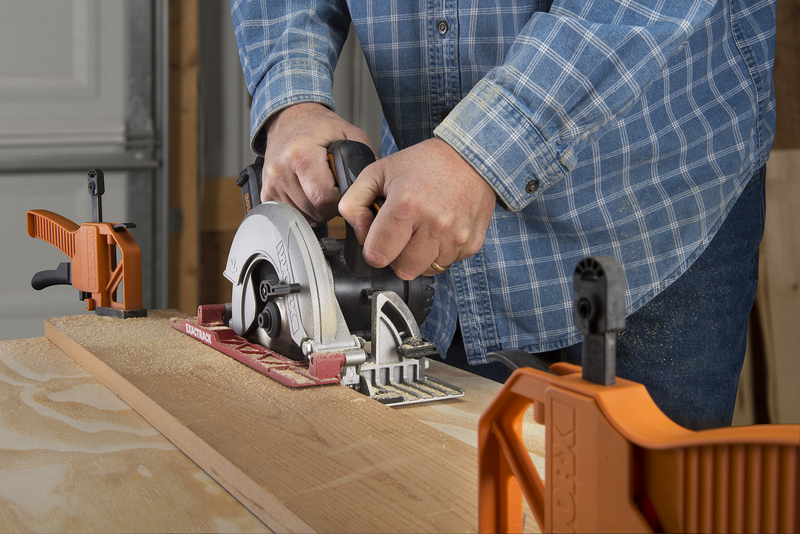 Cordless Circular Saw with ExacTrack takes all the guesswork out of making long straight cuts—each and every time. Built into the saw shoe is the ExacTrack guide (red shoe portion shown above). The guide pivots up and out of the way, allowing you to clamp a straightedge guide directly on the cut line. There’s no need to measure the offset distance from the blade to the edge of the shoe, nor must you buy and attach an add-on accessory. Everything you need to produce perfectly straight, accurate cuts quickly and easily is built right into the ExacTrack saw. Mark the cut line onto the workpiece, then clamp a 1x board flush on the line, to act as a straightedge guide. Remove the battery pack from the saw. Unlock the ExacTrack guide by sliding the red lever at the rear of the saw from Standard to ExacTrack. Pivot the ExacTrack guide upward, and raise the lower blade guard. Set the saw into position with the ExacTrack resting flat on top of the clamped-in-place straightedge. Attach the battery and make the cut. As you guide the saw through the cut, the saw blade will cut flush against the straightedge and right on the line. To resume normal cutting operations, simply slide the lever from ExacTrack back to standard; that’ll lock the ExacTrack guide in place. The 6½-in. saw has a 4,900-rpm motor and is powered by a 20-volt lithium-ion battery. It has an aluminum shoe that pivots up to 50°, and can cut up to 2 5/32 in. deep at 90° and 1 17/32 in. deep at 45°. Other features include a spindle lock, on-board blade wrench, and 24-tooth carbide-tipped blade. The WORX Cordless Circular Saw with ExacTrack (Model WX530L) costs $119.99 and comes with one 20-volt battery and battery charger. And, it’s part of the popular WORX 20V Power Share program that includes nearly two-dozen tools, which all run off of the same 20-volt battery platform. Once you’ve invested in the program, you won’t need to buy batteries and chargers for each and every tool. For more information about the WORX ExacTrack CLICK HERE or go to: www.worx.com.